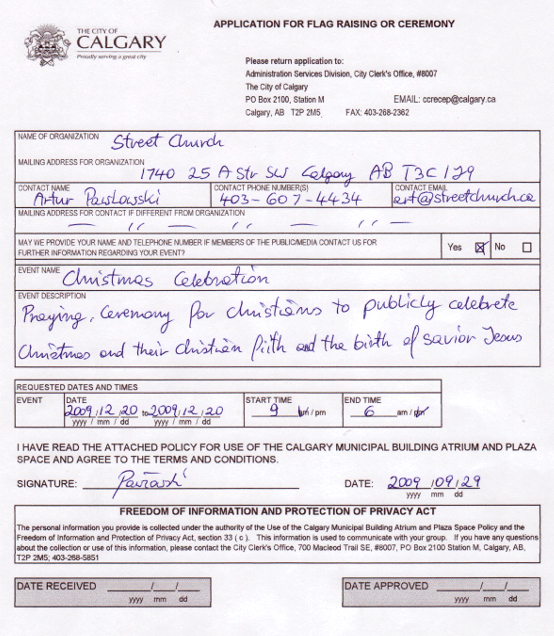 Calgary’s Street Church has indicated that the denial of their request for a flag raising ceremony and a proclamation by the City Clerk’s Office and the Mayor, is blatant bigotry and Christophobia. They indicated that the reason which the City gave was that Christians do not meet the criteria for either request. They further expressed their shock and amazement at the City’s response, since the City authorized a flag raising ceremony on the masts of City Hall and a proclamation just three months prior for homosexuals. The church feels that the requests were the same and that the only difference can be found in the message. 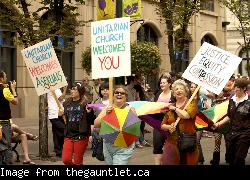 Street Church states that the City now officially endorses homosexuality and firmly opposes Christianity in the public square. "I knew that the City’s Officials discriminate against Christians. Now I have solid, undisputable, proof. They raised the flag of the homosexual community and gave the ‘Pride Month’ proclamation, but when we asked for the same right, they informed us of the answer – ‘NO’. The reason they stated was that we ‘do not meet the criteria’. According to the City website, ‘The City will fly the flags/banners of community groups, charitable or non-profit organizations.’ We are a charity, a non-profit organization, and we serve the community. They made the requirements for applicant clear – ‘It is the responsibility of the ethnic, cultural or community organization to request a flag be flown at City Hall, or to have a flag raising ceremony and provide the flag.’ We made the request and have the flag ready to fly, yet we are denied. What a slap in the face and a straight forward show of bias and bigotry on the part of Calgary’s Mayor and the City Clerk’s office." In applying for a flag raising ceremony and a proclamation for the month of December, Street Church was hoping to encourage the values which they feel that Jesus brought to the world; namely true love, true faith, and true hope. "Christmas is the time of year where people recognize the spirit of love, family, and in the Christian faith the birth of their saviour, Jesus Christ. Our request to raise a flag for Jesus and to proclaim the month of December ‘Jesus month’ was flatly denied, yet Christmas is celebrated in the vast majority of homes in Calgary during the month of December. What troubles me even more about this answer from the City is that their own websites are apparently misleading the public – ‘Proclamations highlight important issues, charitable events, civic-minded individuals, or memorable occasions.’ For Christians what could be a more memorable occasion than the birth of their saviour? This is pure bigotry and we feel that our only option to put a stop to this ongoing discrimination is to file a human rights complaint against the Mayor and the City Clerk’s office. We are calling all people of conscience and moral standards to stand with us against this open attack on freedom of religion, freedom of expression, and this kind of discrimination." Christmas is a time when people celebrate "Christ"mas and this for Christian Calgarians is a precious time to recognize the birth of their saviour, Jesus Christ. All around the world people benefit from the creator who came and died on the cross for our sins and rose again. It’s a time of peace, joy, great celebration and family time. We feel that these values are values that should be encouraged and held in high esteem. We also feel that Jesus was the greatest example of these qualities and his demonstration of and call to holiness, righteousness, and godliness is what makes our society strong. Our nation’s traditions in politics, law, and in all of our history was built on and rooted in Christianity. In fact, a copy of the "word of God", the Bible, was built into the foundation of City Hall at the time it was being built. Also, statistically about 70% of Canadians identify themselves as Christians. Before every City Council meeting, members pray for wisdom. If you have any more requests or questions, feel free to call me directly at (403) 607-4434 or e-mail me at art@streetchurch.ca. Thank you for your applications, we have reviewed your requests and unfortunately they do not meet the criteria in place. The City of Calgary recognizes multiculturalism and our pluralistic society, and we celebrate our city’s diversity and the benefits this offers our community by enriching the lives of all Calgarians. The City recognizes several important cultural and religious events in the community including the Menorah Lighting, Eid celebration and the annual Nativity scene. However, while we allow the celebration of faith-based events at City Hall, we do not issue proclamations for religious or spiritual leaders nor do we raise a flag in honour of a specific religion. I received your letter denying our request; you specified that we do not meet the criteria. Can you explain in more detail what is the difference between proclamation that has been issued for the homosexual community and raising their flag, and what we proposed for the Christmas season. We ask the city representatives for equal rights. · The City will fly the flags/banners of community groups, charitable or non-profit organizations. · It is the responsibility of the ethnic, cultural or community organization to request a flag be flown at City Hall, or to have a flag raising ceremony and provide the flag. We humbly suggest that we are a cultural and community organization that actually meets your documents standards and requirements. · Proclamations highlight important issues, charitable events, civic-minded individuals, or memorable occasions. What we propose is an important issue, charitable event and memorable occasion about what Jesus did for us. He died for you and for me, and rose again so that we could have life! Since we sent the above response, we have not received any response whatsoever. Below you will find the proclamation that was made on behalf of the homosexual community by the Mayor himself. Calgary’s Pride Parade saw a record number of participants and a city hall proclamation that September is Pride Month for 2009. City hall officially recognized the pride parade for the first time ever by flying the rainbow flag, while thousands made the flag a reality on the streets below. With 400 people walking down 8th Avenue representing 40 entrants, there was no lack of pride among participants and the estimated 4,000 people who turned out to watch. The record number of participants made the city’s recognition an extra bonus to the already popular event. 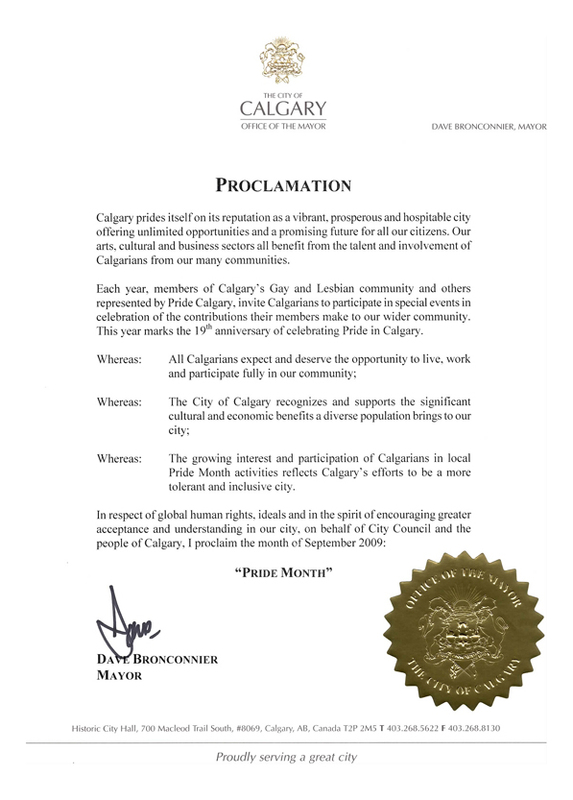 The City of Calgary officially recognized September as Pride Month for 2009, with a proclamation stating: "The growing interest and participation of Calgarians in local Pride Month activities reflects Calgary’s efforts to be a more tolerant and inclusive city." Michael Leboldus, president of Calgary Apollo — a volunteer-run sports club that offers year round events to the LGBT community — said his group has participated for the past decade. "It grows a little more every year, and the bigger police participation is a good thing," he said. For Liberal MLA Kent Hehr, the event’s success fits with his riding’s disposition. 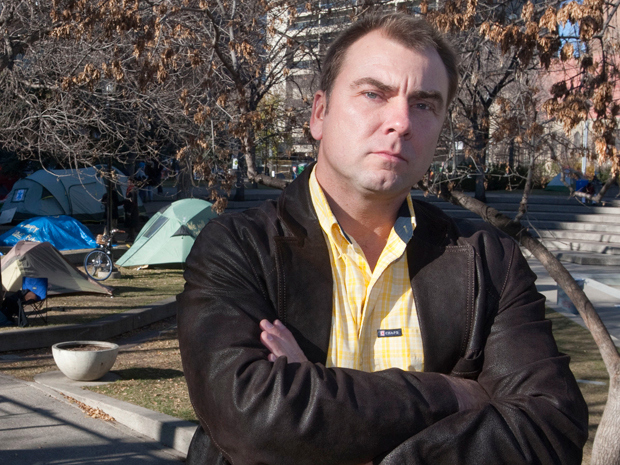 "The people of [provincial riding] Calgary-Buffalo couldn’t care less whether people are gay or straight. The acceptance of all people makes it a great riding to be in." While his riding is accepting, Hehr expressed his dissatisfaction with the provincial government’s handling of gay rights, pointing to an amendment made to Bill 44 last June by Cultural Minister Lindsay Blackett, which Hehr says was worded to be less inclusive for gays. "Bill 44 has slowed progress of human rights in Alberta," said Hehr. "The Conservative party, by passing this bill, has shown that it doesn’t respect lifestyle choices that others make." Despite the frustration of some, the parade was a chance for the community to show its support. The festival that followed the parade was introduced with a few speeches and then a dance took place. There were stalls set up with people handing out pamphlets and selling items. Organizers touted this year’s parade and festival as being for the entire community. One couple who came with the Hillhurst United Church — which had a float in the parade — said they were at there to show their solidarity. "We came to support them," they said. Although they felt that this parade was smaller compared to other cities, "We’re still glad to see as many people out." It has come to our attention, with the release of the City of Calgary’s 2009 "Pride Month" proclamation release that our Mayor and city council are moving in a direction of tolerance for all. I find that very ironic after four years of trying to receive tolerance for the efforts of our ministry in dealing with the City’s homelessness crisis, but instead of receiving tolerance receiving harassment and intimidation. Having said that, this new proclamation is shocking to us and demonstrates a new direction for the City. In particular, we note that the city is embracing new values towards "all citizens". For example, we noticed that the City has now recognized that Calgary benefits "from the talent and involvement of Calgarians from our many communities", that "All Calgarians expect and deserve the opportunity to live, work and participate fully in our community", that the City "recognizes and supports the significant cultural and economic benefits a diverse population brings to our city", and that the City is now interested in "respect of global human rights, ideals" and wants to operate "in the spirit of encouraging greater acceptance and understanding in our city". Obviously, Calgary’s lawyers will understand that such statements, issued by the mayor himself, reflect an attitude of City Council, of being inclusive and open to diverse views and beliefs and demonstrate a desire on behalf of the City, to allow for public expression of those deeply held views with the endorsement of City Council. With this in mind, we request that the City grant us access to the municipal plaza, as stated above, for our Christmas festival, that City Council allow us to raise a flag for Jesus, the central pillar of our faith, on one of the masts in front of City Hall, just as it allowed the homosexual community to raise its flag on a mast during their "pride" event (http://www.calgarysun.com/news/alberta/2009/09/07/10776381-sun.html), and we humbly asked that the Mayor would demonstrate his desire to show "greater acceptance and understanding in our city", by releasing a proclamation that the month of December would be called "Jesus Month". 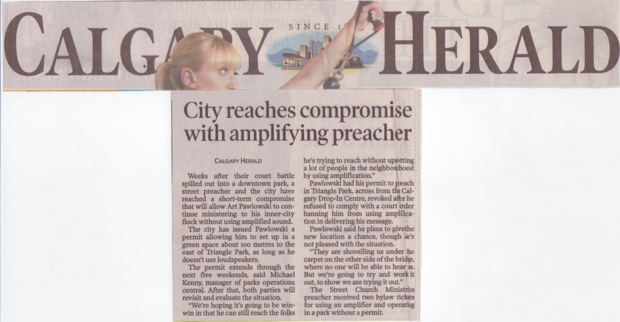 Furthermore, we ask that the City Council and the Mayor, reconsider their malicious policy with regard to the use of the courts and the unprecedented ticketing of Street Church Ministries, in the service of Calgary’s homeless population, and to give its full support to Street Church in its continuing efforts to address the problems facing our city. We are, as always, open to suggestions on how we can work together for the better good of our city and for the provision for the needs of Calgary’s most vulnerable citizens, who also "expect and deserve the opportunity to live, work and participate fully in our community", as indicated in the Mayor’s proclamation. Even though we have checked the City’s schedule to ensure the availability of the plaza for our event, on the days we have proposed, which shows that the plaza is available on those dates, never the less, we are willing to work with the City if there is a conflict we are unaware of. We will be waiting, with great anticipation, for your reply. We have copied this letter to the media, to Calgary’s City Council, to MLAs, to MPs, and to over 16,000 people on our supporters list. Below we have included a copy of the recently released "Pride Month" proclamation of the Mayor Dave Bronconnier, as referenced above.